With the release of Max 7, Cycling ‘74 introduced a number of new capabilities to the venerable visual programming language. Among the many innovations are a several objects and devices that offer new possibilities in real-time intonation, pitch and time correction. 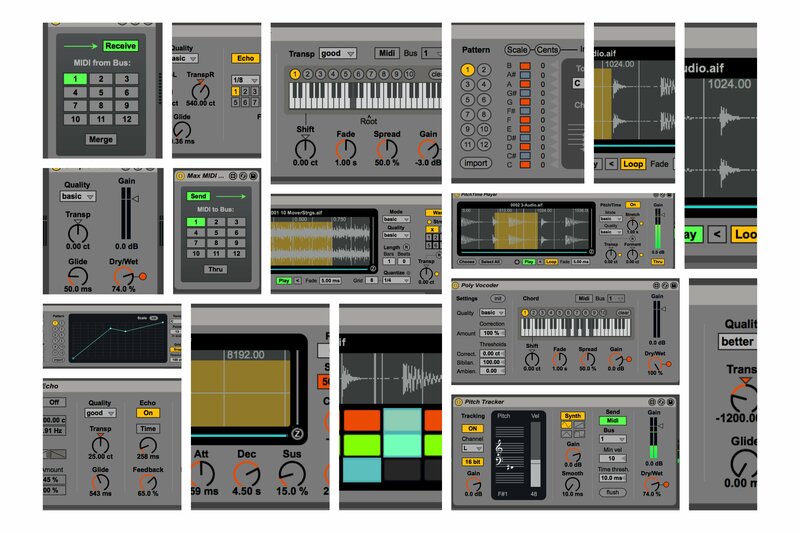 Since Max for Live (as of Live 9.2) is based on Max 7, we wanted to highlight some of the new devices Cycling ‘74 introduced with Max 7 in the form of this convenient, free Pack for all Max for Live users. Classic Player – A standard stereo/dual-mono sample player. This device uses the groove~ object without pitch/time corrections. It features the basic patch structure used in some other more complex examples. PitchTime Player – A stereo/dual-mono sample player with pitch and time correction. This device introduces some settings which control the pitch and time correction feature. PitchCorrect Player – A stereo/dual-mono sample player with pitch and formant correction. This device introduces some settings which control pitch and formant correction. Synced Player – A stereo/dual-mono sample player synced to transport. This device uses the time/pitch correction feature of the groove~ object in order to play in sync with Max or Live's transport. Bit Player – A sequence-able sample player, synced to transport. This device allows for re-ordering sample playback in sync with Max or Live's transport. Sampler Instrument – A polyphonic sampler instrument with time-stretching. This device uses the time/pitch correction feature of the groove~ object in a MIDI instrument structure. The DSP part of the patch is embedded into a poly~ container, allowing you to load an open number of instances of a patcher file, and thus allows the use of polyphonic audio synthesis, audio processing, or even control tasks. Simple Pitch Shifter – A simple stereo pitch shifter. This device uses the pitchshift~ object to perform sound transposition. Pitch&Vibrato – Stereo pitch shifter with vibrato. This device uses the pitchshift~ object to perform sound transposition. We've added a double LFO which acts as a pitch vibrato. Pitch&Echo – Stereo pitch shifter with vibrato & feedback. This device uses the pitchshift~ object to perform sound transposition. We've added a double LFO which acts as a pitch vibrato. Additionally, the device inserts the pitch transposer into a delay line to create the famous "harmonizer" sound. Dual Harmonizer – A dual-mono pitch shifter with vibrato and feedback. This device uses the pitchshift~ object to perform sound transposition. It is similar to the Pitch & Echo device, except that the stereo echo effect is split into two independent mono delay lines, so that each audio channel can be treated separately. Multi Harmonizer – 10 notes/20 voices pitch shifter. This device uses the pitchshift~ object in a polyphonic patch structure, thus allowing multiple harmonizations. The DSP part of the patch is embedded into a poly~ container, allowing you to load an open number of instances of a patcher file, and thus allows the use of polyphonic audio synthesis, audio processing, or even control tasks. Pitch Tracker – This device uses the retune~ object to perform some pitch tracking from monophonic input sound. The detected pitch can be monitored using a simple monophonic synthesizer. The estimated pitch and velocity are transformed into MIDI notes, which can be sent to other devices using the MIDI outlet when the device is used in Max. In Live, we use a special MIDI-side-chaining device, called "Max MIDI Receiver," in order to catch MIDI data from other devices such as the present one. Mono Vocoder – A dual-mono vocoder. This device uses the retune~ object to force a monophonic signal to a given pitch, thus acting like a vocoder device. Pitch correction can be tweaked with some dedicated parameters, according to the type of sound that is processed. Poly Vocoder – 10 notes/20 voices vocoder. This device is similar to the Mono vocoder device, but uses a polyphonic patch structure, thus allowing multiple harmonizations. The DSP part of the patch is embedded into a poly~ container, allowing you to load an open number of instances of a patcher file, and thus allows the use of polyphonic audio synthesis, audio processing, or even control tasks. Autotuna – A scale-based microtonal auto-tuner that can use Scala files. This device uses the retune~ object to tune the audio to a given scale. Scales can be either entered by hand, or loaded from Scala files – a file format for musical tunings that is a standard for exchange of scales. Learn more about Scala. Microtuner – A table-based microtonal auto-tuner that can use Scala files. This device is similar to the Autotuna example device, except that scales are entered using a graphic function whose shape can be curved, thus providing some unexpected pitch scales. Max MIDI Sender & Max MIDI Receiver – In Live, audio and MIDI tracks don't communicate any MIDI data to each other. However, in some cases sending MIDI data to an audio effect might be useful: for instance, if you'd like to send a MIDI chord to a vocoder or harmonizer device using a MIDI keyboard.